This record is not anything like I expected it to be. 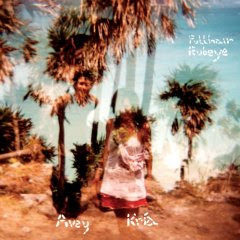 Even though it was finished several months ago, Avey Tare (of Animal Collective fame) and Kria Brekkan (formerly of Mum) took a few too many bong hits and decided that it would be a good idea to release the record with every song playing backwards. Sometimes reversing things in a song can have great results (see: the killer solo in "Tomorrow Never Knows" by The Beatles, or any number of songs by The Olivia Tremor Control), other times it can just come off as creepy sounding or a novelty. With this album it really changes the entire mood of the record. Each song sounds almost surreal, and occasionally the results are stunning and hypnotic. Thanks to the wonders of home recording software and people with too much times on their hands, there is a "reversed" version of the record floating around on the internet which I've also uploaded. With the songs reversed (or unreversed, I guess) we're left a beautiful, mellow, experimental folk record.